As John has learned many times over the years, you just can’t do everything by yourself. 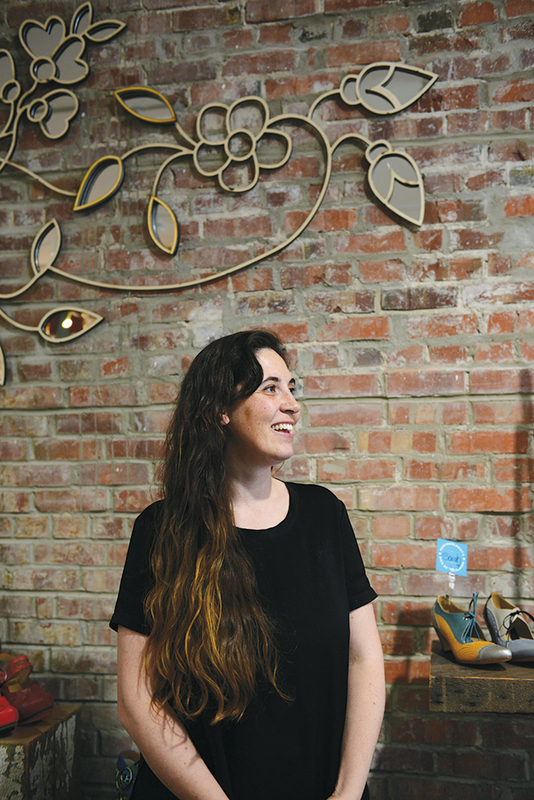 So when the question came of what to do with a huge canvas of brick wall space in the Fluevog Edmonton store, he put out an open call for art proposals and hoped for the best. As always, his legion of followers (aka. you) came through with clever ideas of all kind! Edmonton-based artist Tiffany Shaw-Collinge’s innovative proposal combined traditional Métis floral patterns, passed down from her great-grandmother, with plywood and acrylic construction and became the store’s newest showpiece in June 2017. Keen to keep the ball rolling, John followed this with the Canadian launch of the official Fluevog Artist Grant, a $10,000 fund that supports the growth and development of emerging artists and their unique endeavours. Stay tuned to find out who will receive the first ever Fluevog Artist Grant and for the launch of a subsequent American Fluevog Artist Grant!